This is Jeremy Giraffe. I painted him after drawing him over and over. I didn’t know I could draw or paint, until this year. It is interesting the things we convince ourselves of. I did art at leaving level for high school but had to ditch it before my Year 12 exams (that’s another story). I was firmly convinced that I did not have any style or ability. This year, I began working therapeutically on my ‘ishews’ and started collaging, drawing and painting as part of the process. I am trained as an holistic counsellor, using art and craft as means to process work (I also use stories) so it was a logical follow on for me. I also discovered a Facebook page called 52 Week Illustration Challenge where artists of differing abilities contributed their take on the word of the week. I joined as admirer. 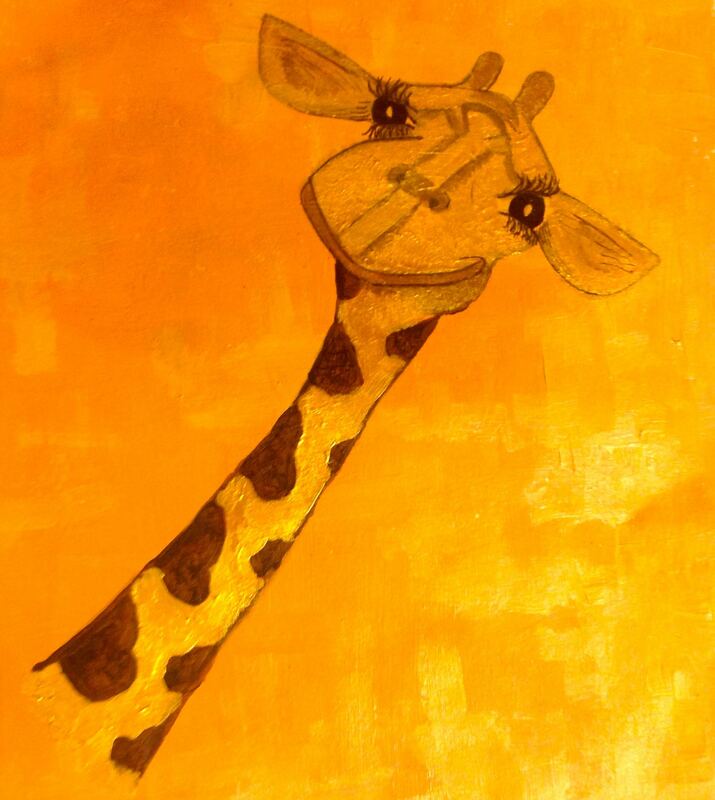 When ‘giraffe’ rolled around, I thought to myself, “Self”, I said, “I’d like to draw a giraffe.” So I gave it a go. I looked at lots of images and no, my painting could never be described as photo-realistic but I really like him. Emboldened I began drawing other animals. I haven’t got much past their necks yet and did you know that ducks can look very sad if you give them a big beak? I like quackers. I like animals. My drawings and paintings are cartoonish and not at all complicated when compared to my zen tangled doodles (that sounds rude, doesn’t it?) but I enjoy the simplicity. I now have ducks, emus, wombats, echidnas and trees. Yes, I really like trees too. None of them are spectacular but all of them have personality and feeling and isn’t that what art is about after all? Jeremy has a rhyme, so do the others although some are being a little coy about revealing theirs. That is the storyteller in me, can’t be helped. I’ll pop them into a book for my grandson. I’ve already done him one book, something about fart-bubbles, he likes it, and now he’ll have another. What else would I do with them? I am currently painting and drawing a peacock. His name is Pomjoy Pobcock, who knows why. I’ve learnt about stretching paper when it’s painted so have prepared the background and having perfected how I want the feathers to look am ready to paint and draw. I need more art supplies. More! More! I have a studio. It’s not full yet. I spend hours in there with little to show but smears of paint and a happy disposition. Think that’s all worth it then. Haven’t cleaned the floors for a few days but they’re not going anywhere. Next year I am taking on the 52 Week Illustration Challenge and seeing what I can do. Might have to paddle fast to keep up, some of the artists are extraordinary and some ordinary. I think I’ll fit right in. I wonder now about my decision so long ago that I was not an artist. I do not aspire to an exhibition or have any delusions about my abilities but I am having fun and I am able to share a feeling with my work. It has made me wonder about what other things I decided I could not do that might be worth trying again. In the meantime, enjoy Jeremy, watch out for Pomjoy Pobcock and when next you come looking for me, check my studio first. Whoever thought letting go would be the hardest part? When you’ve done as many years of analysing, therapy, counselling, processing, meditation, art therapy, music therapy, re-birthing (remember that?) and introspection as I have, you begin to wonder if there will ever be an end to it. Those few years of childhood, confusion of your teens, followed by the fruitcake mixing years of your twenties, followed by the baking years of your thirties, upheaved by your forties (when you have to get the cake off your hips) and sliding in your fifties (when you realise it isn’t going), take a lot of getting over, on, through, out and done with. In fact, I largely suspect that we are never ‘done with’ it and spend our entire lives winnowing the chaff from the seed. How ironic that people of a certain age (and I don’t mean mine) will not recognise that saying, winnowing the chaff from the seed. This was a process (there’s that therapy word again) by which the un-useful portion of a seed head was fluffed out (technical term), leaving the heavier seed. I feel my fifties, and I’m only one year in, are my winnowing years. There is a great deal I have learnt and even more that I have picked up through observation and careful listening. This listening is not something I indulged in as a teen or a twenty but came to grips with in my thirties when I realised all my errors. It’s quite disconcerting to realise that the know-it-all twenties don’t know much at all. I see it now in my young ones. They really do think they know everything and you have grey hair. Reminds me of when my youngest was six and became suddenly concerned that I was terribly old and would obviously die very soon. We had to have a number of conversations about my great age (I wasn’t) and what would happen when I died. I worked out that she wanted to know what was going to happen to her, she wasn’t too concerned with me. Sorted to her satisfaction, we happily sang “When I die, I’m gonna go to God and we’re gonna have a cup of tea” on many car trips. I often tell my young ones to draw on their inner wisdom. I have persistently reminded (aka nagged), imparted sayings and my knowledge and wisdom that they must have absorbed some of it. When faced with a dilemma I ask them, what would you tell a friend with the same problem? Give yourself that same advice. I have to do this with myself too. If a friend came and said she was drowning in debt because the government had callously taken away the single parent health care card and now there are no concessions and utility bills have gone mad, what would I suggest? Oh yes, I’ll try that and let-it-go. If a friend came to me and was hurting because her child had left home, cut contact and their new partner of three months was controlling all communication, what would I say? This last one is a doozy and one I have been travelling through of late. The advice I give myself when I ask me is this, “Self”, I say, “Make it work for you. Leave the door open but don’t stand right behind it. They may come slamming back home. Just gently move back and wait for openings.” Easier said than done, but that’s all about letting go, isn’t it? Most of the time we have distress about it situation is because we think it shouldn’t be like that. I learnt long ago that as soon as I heard me think the word “should”, look out. Sometimes situations just are like that. Now, I know my son is on his big adventure, living with his girlfriend for the first time and not actually doing anything to me. The fact that he has not called me once, only texted, is what it is. Sad and hurt is how I feel about it. The fact that I thought I was talking to him on Facebook only to discover it was his girlfriend shattered me. It seemed as though I was not going to get to talk to my son at all. (I showed my eldest the strange thing he had written, calling me by my name, and she said that’s not him but his girlfriend, speaking as him. I know, right?) Who knew that it was so painful for your child to move away and ‘forget’ you? I know I’m not really forgotten but we can only tell how someone feels toward us by their actions. Let it go. Letting go. Not something I have been particularly good at. Not something any of us are particularly good at. I’m working on it though. My baby will be ready to leave home in just a few short (oh, so short) years and I had better be ready. Hmm, I’ll actually be child free then. What an interesting idea. When you search deeply enough you get to the star stuff within. WARNING: this is a personal post. If you are only wanting stories, check out my other posts. The layers that surround us, that cover up the star dust of our essential selves, distract us into thinking that the layers are what truly matters. I know, there have been many self help books that talk about the business of getting to the core of ourselves, our truth. But what is truth without a little dressing, to make it palatable to the tongue? For this exercise I am going to focus on myself. Peel back the onion layers. I know they are not real. I want to see the shine of the star stuff within. Over the decades since my childhood, blighted with physical, mental, emotional and spiritual pain (because, gosh darn it, why not have it all? ), I have spoken with many therapists. Talking therapy doesn’t do much for me, although there has been the occasional counsellor who has been strategic and practical enough to suit me. Energetic healing accompanied by spoken acknowledgement and linking to the source of pain works for me. I find this fascinating as I am generally a logical person and don’t have a lot of time or interest in naval gazing. I feel I ought to find energetic healing inaccessible but the opposite is true. I am also a creative person. Whether it be stories, my garden, art, craft, solutions to problems or something I really want but have limited budget for, I generally manage to do it. Friends often comment on my creativity or my creative solutions to problems. To me I focus on the problem and look at it from every angle, trial solutions in my imagination, then inspiration strikes and the answer becomes apparent. A recent example is creating a cinema on my back deck with only $500 to spend. After a few months of thought, research and mental trialling, we have our cinema. It is lovely and for less than my budget. Solved. I have employed the same strategy for dealing with feelings and behaviours. I have observed that foster children often have autistic-like behaviours due to the trauma of removal or abuse or both. Reflecting, I can see the same struggles in myself. I have at least one brother on the spectrum and I suspect that if I am not ASD then I have thinking processes that mimic autism due to trauma. I stepped into young adult hood completely baffled by people’s behaviour and often needing to shut down to process. I have had to think my way around their behaviour and become skilled at picking up nuances to determine dynamics and meaning. The most useful thing said to teenage me was that other people’s behaviour had to do with their lives, not me. Having grown up with a bi polar father and a clinically depressed mother who suffered from acute social phobia, this was a revelation and a relief. I can remember panic attacks from quite early on, migraines from the age of six and the beginning of a stomach ulcer by fifteen. I was bulimic through my final year of high school and had severe stomach pain and digestive distress from my mid teens until my forties. I ate to change how I felt and I ate to push feelings down. Due to the digestive distress (I like that phrase), I often violently rejected what I had eaten. I had endometriosis, asthma, arthritis from a young age and early onset menopause, resulting in a radical hysterectomy when I was forty. All that on top of or because of the abuse. I am going to examine one aspect of the abuse that appears to be the driving force of my illnesses, compulsions and devastating low self esteem. I’ll start from the beginning. My conception was due to teenage hormones. My pregnant teen mother, abandoned by her boyfriend, determined to give me the best chance by giving me up for adoption. At the time of my birth, it was the practice to remove the child immediately from the birth mother so no bonding could occur. My mother screamed the house down until she got to hold me, unwrap me, count my fingers and toes and note that I looked like a baby from her family. Then I was taken away from her (again) and after the requisite time in hospital, placed in the babies’ home. I have a memory from there. This is a visual and sensory memory. My feet are tiny, I am lying on my back, there is nothing to look at (I can’t even see the light) and I feel ice cold. I think my little heart was broken. Now the point of this exercise is to identify how I feel about each of these abandonments. I. Feel. Absolute. Fury. I am angry that that callous boy and his family did nothing to support my mother. I am angry that there existed the mentality that some women were not fit to be mothers due to their marital status. I am furious with the practice of removing babies at birth and I am desperately heart broken that that little baby girl ever knew a time when no-one would come. Then I was adopted. My adoptive parents already had two boys and I think they were pleased enough with me when I was a baby. As a toddler though it appeared that my adopted mother simply could not make time for me. From the age of three I was sent to my god parents’ home for sleepovers. The old man there made my nights a nightmare. I am unsure of what was going on at my home at that time but I do know that it became a scary place to be as well. How do I feel about that betrayal and desertion, the abdication of parental responsibility and my small child right to safety and protection? I feel a profound sense of loss and grief. The well for this is so deep that it swells up around me, girdles my belly and swells into my throat. I feel a deep seated anger that our parents put themselves before us and I feel an heart broken betrayal that I became a nuisance from the age of three. My parents were not good people. They appeared to be from the outside but I know others found them strange as they got to know them. It took me years to work my way out of their delusions. From the age of five, my father would beat me with his strap. I cannot imagine what a five year old could do that deserved such treatment. My mother could hit hard enough to leave hand welts but her favourite technique was sneaky pinch twists with her hard nails. We were often sent away for weekends and somehow pedophiles were found for everyone. I learnt early not to cry or show any reaction. With yelling at home, the strap and other punishments, verbal abuse and sharp slaps, my home was not a fun place to be. School and stories were my solace. My mother once left my eight year old self in a department store in the city while she dashed off to put money in the parking meter. WHO leaves an eight year old by herself in a busy city store? I managed to get myself cornered and molested by an old man. My mother was furious with me when I told her. Yes, with me. If I had done exactly as she said it wouldn’t have happened. Seriously? My children once tackled me on my over protectiveness but none of the things that happened to me forty years ago have happened to them. They know how fiercely I protect them and how I would leap into battle on their behalf. They know that they are loved and wanted. How did I deserve any less? It infuriates me that the parents I loved and had every right to be protected by failed so terribly. My siblings and I paid the price. I was seventeen when I found out that my father was not supposed to beat the crap out of me. He was resisting hitting my second brother as he had broken my brother’s collar bone and it was still healing. He took it out on me and I went to school with my legs ripped up. I was mortified. My friends were horrified. They told me about child rights and child welfare and I threatened him with it. There was much yelling but he never hit any one of us again. He had other ways to torture me. With every rejection, every desertion of duty, every dereliction of love, they failed. They adopted four children. My elderly mother bewails that we are not a close family. No, I do not enlighten her. I sat down with my parents, and my sexual abuse counsellor, at the age of twenty-six to talk it through. My mother said that it was discipline that lifted the skin from my legs and left scars down my arms and if only there was an adult to verify my story of sexual abuse. To my surprise my father apologised for frightening and hurting me. He spoiled that later by asking if I had discovered any more repressed memories. I looked him in the eye and said that I had not as I had never forgotten. When you reach adulthood and no one has kept you safe, you simply don’t know how to do it for yourself. I went through two rapes, one severe breakdown and numerous panic attacks before I worked it out. Then I married someone who treated me the same way as my parents did. They suffered hyper states, severe chronic depression, severe anxiety, social phobia and had hateful parents. The sicker I got (and I became increasingly ill over the thirteen years we were together), the angrier they became with me. It was bloody endless. It took me six years from when I realised we were no good together until I got out. It took my male energetic healer and counsellor at the time to say to me, you know what to do and when you hurt badly enough you’ll do it. I did. I don’t ever want to go through that again. How do I feel about this? Intellectually I know they were all doing what they were doing without once thinking of the impact on me. Experientially, I was systematically disintegrated into nothing and no one. I am furious that it happened and I am angry with myself that I allowed it. I knew I was being abused. I couldn’t believe it but I knew. I know the best prediction of the future is the past. I am educated and intelligent. I am logical and creative. Yet. Yet I have a lifetime of suffering abuse. I feel defeated that I am too afraid to try for love again. My son recently left home. Intellectually, I celebrate his grand adventure but I could feel myself disassociating and sliding into nothingness, triggered by my perception of his abandonment. I could feel myself slipping away and all the signs and symptoms of an episode of depression were signalling furiously. This time I went for energetic healing and we finally got down to my core issue of desertion, which triggers my anxiety, compulsive behaviours, drops my self esteem even lower and then the slow slide, desperate scrabbling, into the abyss of depression. Not this time. He’s gone on his adventure, I’m just starting mine too. I know how much he will think of me and miss me. I will too. I am turning 51 this year. It is time. I can argue with myself that it was all a long time ago, get over it. I can tell myself that worse things could have happened and do happen over the world to all sorts of people. That does not make it okay and I will not minimalise anyone’s suffering, including my own. For I am still reacting in the old ways. I will take my anger and my fury over all the desertions of delinquent parenting and partnership and hold it up to the star stuff, the light within, to see clearly. This time I will shine.